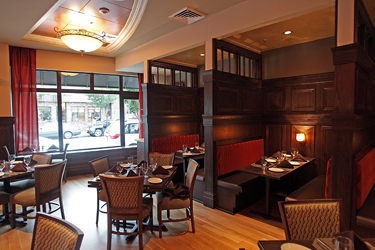 Abby Park is a Greater Boston hot spot conveniently located at East Milton Square. Designed by renowned designer Steve Todisco, Abby Park provides classic American fine dining with a contemporary flair while recollecting the Milton Abbey in Dorcet, England. As the first restaurant in Milton with a full bar since the 1800s, Abby Park is the perfect location for special events or spontaneous gathering. Executive Chef Michael Pirini, a Johnson and Wales graduate with an impressive list of culinary accomplishments, has developed a menu using fresh organic ingredients with a creative but affordable style for a true fine dining experience. A manageable wine list complements the food with varietals from South American, Italian and American producers. In addition, Abby Park is home to The Adams Room, an elegantly comfortable banquet and meeting room available for private and business functions of up to 35 people.